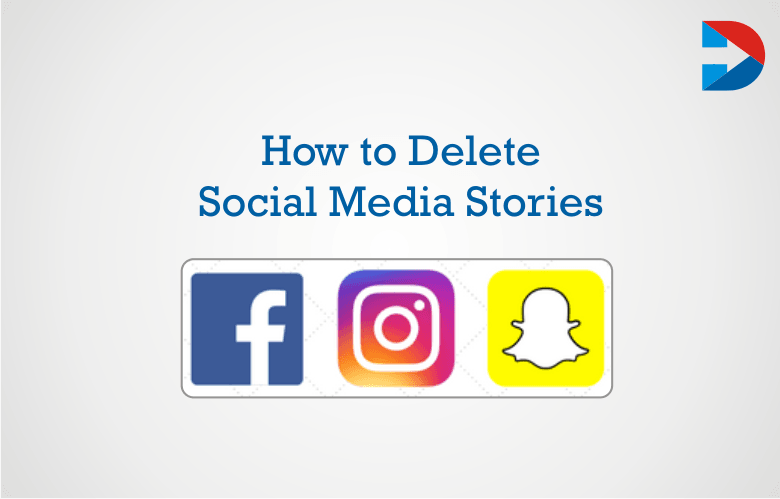 How to Delete Social Media Stories - Digital Marketing : Social media marketing, research, news and more! Storytelling and content marketing are upright and work together for social media marketing. Due to their growing popularity Stories have a tendency in storytelling forms in Social Media. Social Media Stories are the most trending ways to advertise Brands. Social Media stories Originate by Snapchat. Later Facebook Messenger and Whatsapp proposed stories to feature and latest Instagram also joined in the list. Companies predominantly depend on social media to reach their targeted audience. Social Media Stories are equally partaking in social media advertising. Social Media stories are nothing but a collaboration of photos and videos which will be appearing for 24 hours later disappears. In another way Stories enables users to create a collection of pictures and videos in a short story format that only looks for 24 hours. Stories allow adding content throughout the day without deleting the previous story. Social Media stories offer endless opportunities to the business for their growth. Stories come up with fresh content every day to entertain more audience. As we know that how to upload stories to social media accounts such as Facebook, Instagram, Snapchat, Whatsapp as well as YouTube, social Media Stories are time sensitive, Visible for only 24 hours later, it disappeared from your account and moved to Archive list. Facebook recently introduced the Archive option to the Facebook app where your stories saved on Archive for later use. You can view posted stories anytime and repost it as stories or as a post. If you don’t want to see the stories from Archive, the only thing you should do is, delete it permanently. select “Your Archive” which is located at the top right corner of the app. Select the post to delete it permanently. Choose three dots option (…) which is located on the top right corner of the post. It may be a photo or video that applies the same procedure for all. Facebook will display a confirmation Window like “Are You Sure You Want To Delete this Photo?”. You have successfully removed the Story from the Facebook Stories. YouTube Stories feature rolled out for YouTube content creators, only for the accounts which have more than 10,000 Subscribers. All the social media platforms launched their versions of stories feature. But for a change, YouTube also rolled out YouTube stories feature with extraordinary features. YouTube stories stay up to seven days, in that span users can comments, like, dislike it. It will appear for both the subscribers and non-subscribers. It’s simple to create a story on YouTube just tapping on the “Create Story “option. Sign in to the YouTube Account. Wait for a while the video or photo completely loaded to delete. Select the three dots(…) option to delete the story. Choose “Delete” from the menu. Tap “Delete” to delete the video or photo from the stories. Instagram stories are the best ways to promote your business. Instagram Geofilters have a high tendency in Instagram Marketing. Instagram stories let for 24 hours later it will be deleted automatically. What will you do in case if you post wrong photos or videos on Instagram Stories? You don’t need to wait for 24 hours to delete the Instagram stories. You have full control over stories on Instagram to remove anytime. Go the Instagram app on your mobile device. Deletion of Instagram stories follows the same procedure for both the Android and iOS users. Tap on the You ring that means Instagram stories avatar from your account. Now Move “Forward” and “Backward” to choose desired images or video to download. Tap on the “More” represented by three dots at bottom right corner of the screen. Select “Delete” from the menu to delete the desired photo or video. It will display a confirmation window you want to delete the post which is no more visible after deletion. Select the “Delete” option from the pop-up. By deleting this photo or video, it is no more visible in your story. Snapchat originated the Snapchat stories in social media marketing. Snapchat offers countless options to the business to brand marketing. Once if you posted the wrong stories, need not wait for 24 hours. You can delete it anytime. Go to the Snapchat app on your Mobile phone. Choose “ Stories” from the Snapchat Memories. Choose One story that would like to delete. On the left side of the Story, You can see three dots (…) option. Tap on three dots option, and it will display a drop-down menu with six options. They are Export Story, Name Story, Add to this story, Delete story, My Eyes Only and Send Story. Select “Delete Story” third item from the list. Tap on “ Delete.” Now your selected story is removed from your memories list. Whatsapp has 175 million daily active users. Whatsapp has an equal amount of users for both personal and business purpose. Whatsapp stories are nothing but WhatsApp status, like Snapchat and Instagram stories you can post anything on your status. To access the status on Whatsapp tap else swipe left to the screen. Record the status directly or add it from the gallery. You can view someone else status easily tap on the status option. You can reply to the status of the other just swipe on the story and comment on it. Whatsapp status also appears for 24 hours later it will disappear. If anyone likes to delete it before the time, follow the steps. Tap on the “Status” screen on Whatsapp. To delete the photo or videos, tap and hold on the Status. After holding for a second, delete option will appear on the top bar of Whatsapp. Tap on the “Delete” icon to delete. Whatsapp will display a confirmation message in a window this will be deleted for everyone who viewed your status. Click on “Delete” to delete the status. Social Media Stories is one of the best ways for Digital Marketing. Everyone familiar with the creation of Social Media Stories but, at the same time people should know how to delete the Social Media Stories. Here we notify the complete procedure for How to remove social media stories such as YouTube, Facebook, Whatsapp, Instagram, and Snapchat.